Pin patterns to washcloths placing bottom edges of puppet pattern on finished edge of cloth. Do not cut yet. Transfer MARKINGS for faces. Embroider nose, eyes and paw pads using a SATIN STITCH. Embroider mouth using a CHAIN STITCH. Cut out body pieces. 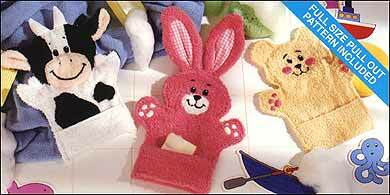 Cut out appliqués for bunny ears and muzzle, cow head patches, body spots and muzzle. Appliqué pieces to puppet bodies. Appliqué gingham inset to front of ear. Stitch ear front to back. Trim Seams. Clip curves and turn right side out. Form tuck at the center of the ear. Clip Curves and turn right side out. Fold along fold line. Baste to head, having raw edges even. Fold horns in half with right sides together, stitch curved edge. Turn right side out. Press seam to center back. Stuff lightly. Baste to head having raw edges even. Fold up lower edge of puppet front along fold line, forming pocket. Baste along side edges to hold in place. Stitch front to back at side seams. Clip curves. Trim seams to 1/8", turn right side out. Top stitch 1/8" inch all around leaving lower edge open.